About: Speedy Graphito is a French painter who was born in Paris in 1961. He is one of the pioneers of the French Street Art movement alongside others like Jérôme Mesnager, Miss Tic and Blek le Rat. By 1989 he had participated in a number of group art exhibitions mostly in Paris, and by the late 1990s Speedy Graphito’s unique street art style was exhibited in art galleries across Europe. By imposing a powerful, innovative style in the early 1980s, Speedy influenced a generation of urban artists. Though his work has evolved considerably over the past few decades, he has become known for his exploration of commercialism and references to pop culture images and icons. Very inventive, he uses all forms of expression – painting, sculpture, installation, video and photography. His graffiti, incorporates dynamic characters like those of the Catalan designer Javier Mariscal or American artist Keith Haring. Other influences include America of the Fifties, cartoons, Manga and images of Maya culture. Particularly influenced by the iconography of Disney characters and video games, Speedy Graphito often turns a critical eye on our society, as his works feed off the collective memory of iconic imagery to create a new universal language. As an example, Speedy Graphito’s “Temptation 2011” features Disney’s Snow White enamored with the half-eaten logo of Macintosh Apple, creating a shrewd and satirical message about consumer seduction. Today Speedy Graphito is internationally one of the major figures of his generation. He lives and works in Paris. Where you can see it: Speedy Graphito’s paintings, prints, and street art murals can be found worldwide. Already recognized in the international arena, Speedy Graphito’s Art is well known in France, England, USA, Belgium, India, Japan, Brazil, and Dubai, as well as major auction houses. 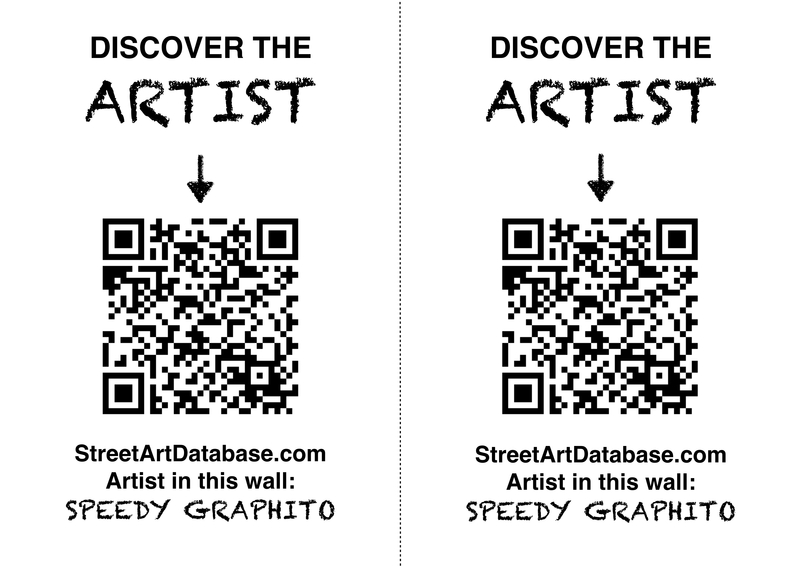 PRINT CODE: help tagging Speedy Graphito in the streets of your city! Posted in graffiti, stencil, street installationBookmark the permalink.